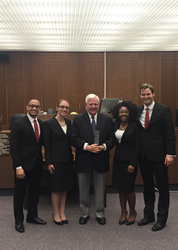 Stetson University College of Law’s trial team won the southeast regional of the American Association for Justice Student Trial Advocacy Competition. (L-R): Stanton Fears, Brooke Batton Charlan, Judge Gary Farmer Sr., Phylicia Pearson and Kyle Ross. Through its preparation, talent and professionalism, our team illustrated why Stetson is the best advocacy program in the country. Stetson University College of Law’s trial team won the southeast regional of the American Association for Justice Student Trial Advocacy Competition in Ft. Lauderdale, Florida. Students Brooke Batton Charlan, Stanton Fears, Phylicia Pearson and Kyle Ross won the AAJ regional on March 22 and earned the right to compete in the national competition April 16-19, in Pittsburgh, Pennsylvania. The AAJ Student Trial Advocacy Competition is one of the largest mock trial competitions in the country. This year, 224 law school teams competed in the qualifying rounds in 14 regions. Stetson’s trial team tried a products liability case. A second team of Stetson students, Franklin Farago, Chad Florin, Daniel Miles and Allison Stevenson, also competed, and Stetson Law graduate Shaun Cummings ’14 and Professor Joiner coached the teams. For more information about Stetson’s award-winning advocacy program, visit http://www.stetson.edu/advocacy.